You work full-tme and earn a decent salary and your spouse stays at home with the kids. Over the years you have contributed to a Spousal RRSP and have accumulated funds inside the RRSP. You wonder if your spouse should withdraw the funds from the RRSP tax-free now while they have no income and then invest the money outside of the RRSP. If you have contributed to a spousal RRSP in the current or preceding two years, the amount withdrawn will be added to your income but only up to the amount you contributed in the current and preceding two years. This means that if your spouse withdraws $10,000 from the spousal RRSP and you contributed a total of $4,000 to the spousal RRSP during the current year and prior two years, you must include $4,000 in your income and your spouse included $6,000 in theirs. These rules are designed to impose a waiting period in order to prevent one spouse taking a deduction and the other spouse withdrawing the funds tax-free. What happens if you don’t make any contributions for three years and then withdraw $10,000 or less? Your spouse can withdraw an amount tax-free from the RRSP that is less than their basic personal amount, which in 2009 federally is $10,320. However, the $10,320 is considered income for the purposes of determining the spousal tax credit and the withdrawal would eliminate the spousal credit in the year of the withdrawal. In addition, if the funds were then invested, the investment income would reduce the spousal credit annually. 2009 – $1,200 (no further contributions will be made). The current balance in the RRSP is $12,000 and they are residents of Ontario. Jane and Tom feel they can withdraw $10,320 from the spousal RRSP this year and investing the funds in a non-registered account. By doing so, they feel that they can access the funds at any time and no longer need to worry about taxes should they need to access the funds. The amount of the withdrawal exceeding Jane’s contributions from 2007 though 2008 is added to Tom’s income and the difference is added to Jane’s Income. As a result, Tom will have taxable income of $3,120 and Jane’s taxable income will increase from $120,000 to $127,200. The increase in Jane’s income increases her taxes payable and the increase in Tom’s income, while not taxable, reduces the spousal credit Jane’s claims on her taxes. * Includes the basic personal tax credit of $10,320. 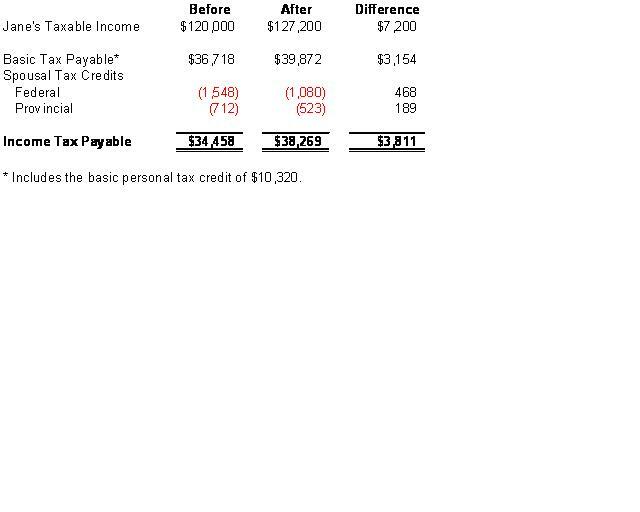 From this table you can see that the withdrawal was not tax free because Jane’s taxes actually increased by $3,811. If the $10,320 withdrawn from the RRSP is then invested what is the impact to Jane and Tom? Since Tom has no other income, the $10,320 would generate about $720 in income (in 2009). This income is not taxable to Tom but would reduce Jane’s federal spousal credit by $108. And going forward Jane’s spousal credit would be reduced by the investment income earned by Tom. Since Tom’s income is not taxable the invested funds would grow at the same rate outside the RRSP as inside. At age 71 the $10,320 would be worth $118,000 whether it was invested inside the RRSP or out. In this scenario, Jane and Tom withdrew from Tom’s RRSP and incurred a one-time tax increase of $3,800 plus will have Jane’s spousal tax credit reduced annually going forward. In the end, all that happened was that Jane and Tom paid more tax. If Jane waits three years and does not make any spousal RRSP contributions, and then withdraws the funds from Tom’s RRSP, Jane’s spousal tax credit will still be reduced and they are not really ahead. The best strategy in this case would be to leave the funds in the RRSP. The scenario assesses whether it makes sense (tax efficient?) to take money out of the Spousal RRSP or not. What if the couple needs the additional money, it’s just a matter of whether to take it from the income earner’s RRSP or the Spousal RRSP? How do the numbers play out? If they require the income from the RRSP, It would make sense to take the funds from the lower income earners RRSP. If that is a spousal RRSP, then the attribution of income may be applied to contributions made in the current and prior two years. Hi, My wife and I put money in a spousal rrsp, my wife has no income, we where thinking of waiting the three years and then she could start withdrawing $2000.00 per month. I am under the impression that she will be taxed .5% of that amount and it will not affect my spousal deduction of her on my income tax deductions?? If I can’t do this what is the point of splitting my income by spousal rrsp if I lose her as a deduction? @Bob – After the three year period is up, and withdrawals are tax in your wife’s hands and reduce your spousal deduction. However, your wife will be claiming the basic personal amount on the first $10,320: This effectively shifts the credit from you to your wife. The loss of the credit is a non-issue. If you are both over age 65, you’ll be able to claim the pension income amount and age amounts as well. The income splitting comes from lowering your annual income to a lower bracket than it would have been had you claimed all of it. The .5% per month is the amount CPP is reduced under age 65 and the amount it is increased after age 65.
say Jane & Tom are 55 and Jane retires this year, they plan to withdraw $10,320 next year. Is there tax savings considering income splitting? @Paul M: Withdrawals from an RRSP cannot be split unless the RRSP account holder is over the age of 65 and is either receiving RRIF minimums or annuity payments from an RRSP. During the 2009 tax year I contributed $1000.00 to a spousal RRSP in which my wife is the annuitant. Who deducts the $1000.00 on their tax return? @Mike: You take the deduction and it affects your RRSP contribution room. I have 2 rrsp accounts, one of which is a spousal that my husband paid into until he retired two years ago. I am still working but will retire next year. Neither of us is yet 60. @Catherine: You have 2 RRSP’s: A spousal plan and a regular RRSP. If you withdraw from your regular RRSP, the withdrawal will be taxed in your hands. If you withdraw from the spousal plan, the withdrawals will be taxed in your husbands’ hands to the extent of any contributions he mad to the spousal RRSP in the current or prior 2 years (2010, 2009, and 2008). I make a fair wage but needed to withdraw RRSP’s to pay down bills etc… the RRSP’s were in my name and I paid large amount tax when I withdrew the funds. Now it is tax time, can my wife claim the RSSP’s on her income rather than me as combined spouses income tax return? @Help Me: In Canada, we do not combine spouses income on a single return. Each spouse must file their own taxes. Unfortunately, you cannot add your RRSP withdrawal to your spouses taxable income. If I want to withdraw this amount out of Spousal RRSP, I have to do that in 2 years so that my wife does not have to pay extra taxes because of her basic amount. Therefore, I will forfeit about 4,000 in spousal tax credit for the next 2 years. I guess that I can reclaim the spousal tax credit the third year (or a portion of it in the second year) if we put the money withdrawn into TFSA. Is it correct? Any contributions you made to the spousal RRSP in the current and prior 2 years are added back to your income if withdrawn. If you have not made any spousal RRSP contributions in the last three years you probably have not attribution. Any amounts your spouse withdraws is added to her income and affects the claiming of the spousal tax credit. However, if she only has $1,200 UCC she can withdraw around $8,800 tax free. A spousal plan was opened nov 2006. with $9786. 00 and $125.00 is deposited every month. They now have $14,800.00 in the plan. Now they need to withdraw $5,000 for home repairs. ? Is it first money in, first money out? How much are they allowed to withdraw? If the withdrawal was done this year the maximum attribution is the amount of all spousal contributions in 2010, 2009 and 2008. Last year (2009) I opened a spousal RRSP account on my wife’s name (I thought so) and contributed from our joint account. We are buying a house now and as first time buyers, we are allowed to make a withdrawal from RRSP. I can’t use this account for HBP, as I have already used HBP request for my personal RRSP. The funds which we put aside for a down payment are completely unreachable. On top of it I might have some problems with the CRA. Assuming that the financial institution could reissue a receipt on my name (as a annuitant and the contributor at the same time ), I still can not free the funds from “my spousal” account without paying high taxes. Is there a chance that the financial institution could correct their mistake? Firstly they refused, but maybe there are some ways of correcting it. And if they don’t, what other options do I have? You might want to discuss this with the financial institution. They have an obligation to ensure what they deliver is what you asked for. If you were under the impression that your wife was the annuitant and they did not open the account properly, then you have a strong case. Your argument will be very strong if you told them your wife had no income! Start with the branch manager and move to their HQ if you get nowhere. It will have to be the FI that makes the correction though. In our situation, I contributed to a spousal RRSP from 2000-2006 and there is $64,000 in the fund. I now have the opportunity to purchase 28 months of service through OMERS for $36,000 which will result in about $3,500 per year additional pension and allow me to retire earlier. My spouse has no income, and supports purchasing this service. However, I must be the annuitant in order to transfer money from an existing RRSP without incurring tax penalties. I only have $4,500 in my personal RRSP. Any ideas on how I should proceed? Thanks! Unfortunately, you cannot use the spousal plan nor transfer from the spousal RRSP to an RRSP where you are the annuitant. The only option you have is to use the $4,500 in your RRSP. If you have other investments, you might want to use them instead. If you withdraw, you’ll never get the contribution room back. Your contribution limit is 18% of the prior years earned income to the annual maximum. I have some money in my spousal RRSP a/c. This amount was contributed by my husband before 2004. Now I have only limited income for 2010. If I withdraw 10,000 from my spousal RRSP will it be taxable? How does it work? Please advise. As long as your husband did not contribute in 2010, 2009, or 2008, there will be no attribution back to him. The withdrawal should be taxed in your hands and as long as your income total taxable income including the withdrawal is under $10,000, then you will not pay tax. You need to consider the impact on the spousal tax credit. Every dollar you earn, your husband loses the tax credit at the federal and provincial rates. So while, you withdraw tax-free, he will lose the tax credit equal to your withdrawal. I don’t see any benefit if the withdrawal is only for tax purposes. I’m not sure I fully understand your question. The withdrawal will be subject to a withholding tax, which is a prepayment of your income tax and not a penalty. See this article for the withholding tax on RRSP’s. The withdrawal will be added to your income tax and taxed at your marginal tax rate. Your withdrawal will be taken first from her contribution in 2010, then any made in 2009 or 2008. You don’t get to choose. My wife and I retired in November 2011. I have paid into a spousal RRSP over the years and in Feb of this year we will cash in $5,000. Who’s income must claim this withdrawl? Contributions made by you to your wife’s RRSP in this year and the prior 2 will be added to your income to the extent of your contributions. I contributed to a spousal RRSP last year. Am about to contribute this year again. However, I am planning on leaving the country next year to relocate back to the UK. Is my wife able to withdraw from the spousal RRSP in 2014 and 2015 respectively as the funds will not have been touched for a 3 year period. Of course, if she is working, then she wold be taxed on her rate? Hi – my wife has the opportunity to do a teacher’s pension “buy back” for time missed when she was on mat leave. I was going to do a spousal contribution to her in 2012 (ie. she gets the funds in her RRSP, I take the tax deduction), then execute a transfer in early 2013 to do the buy back. Transferring RRSP’s to the pension is common and not deemed a “withdrawal”. Would we be good in this case, even though she has only had the money for 12 months, or is it possible that I could face a tax liability? It’s not a withdrawal that triggers the attribution. Thanks – just wanted to clarify this. Does this mean that a transfer to her registered teacher’s pension from a spousal RRSP plan under 2 years from the contribution will be taxed as income on my return? All the rules talk about the attribution being triggered by a withdrawal, but this is a transfer to another registered account. We’ve done spousal RRSP transfers to pension before, but my wife had the money in the plan for at least 3 years. I am getting so many different answers on this from CRA, Pension, CIBC and I don’t want to make a $10,000 mistake! The transfer is not a withdrawal and attribution does not apply in this case at all because its going from one registered plan to another. Often banks and other advisors confuse pension rules and tax rules. Whether or not a transfer from a spousal plan is allowed under pension legislation is another matter entirely. I have been contributing to spousal RRSP for my husband, he is retired. I plan to retire in 2015 and have my husband start to take income from the spousal rrsp at that time. I will stop contributing to that spousal plan in Dec2012. For 2013 and 2014 can I contribute to another spousal plan or does the 3 year rule mean that even though money is in a different plan, I will be taxed in 2015 when we start to take income? The rules apply to all contributions and withdrawals. The rules do not apply on an account basis. When we lived in Burlington Ont, My wife contributed to a Spousal in my name since she made quite a bit more than me. We haven’t contributed for over 5 years and now the roles are reversed. I am in a high tax bracket and my wife is a in a low tax bracket. We find ourselves in need of some cash right now and are wondering what happens if I cash in the Spousal RRSP in my name (about $150 K). Will I pay the tax on that on my rate or will she pay it at her rate? Provided she has not made further contributions in the five years, the withdrawal would be in your name.